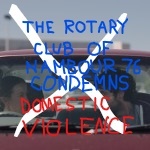 At a recent club meeting the Rotary Club of Nambour 76 vowed to do whatever we can to stamp out the scourge of domestic violence. Do whatever we can to reduce the wait time at domestic violence hotline call centres. Support education programs aimed at stopping domestic violence before it starts. We are making the commitment and we are open to suggestions as to the best way to get the job done.